Well not now anyway, I know A LOT of members who pulled out and many signed up for these pre order kits before Anovos even started advertising, hence Anovos reaching out to anyone who had shown interest in the kits, looks like they'll have a few left over. Both Alpha and Beta kits were considerably inaccurate and required a lot of extra work to make them right. This latest version is no different. What's new? Despite Anovos's obvious shortcomings I'm not aware of a single FOTK armor supplier that has an "out of the box ready" product that only needs assembly without painting. Is there something new on the market? Agreed but Anovos kept insisting "these kits will not require paint" well true if you don't want them 501st approved, seems strange they don't think about 501st approval when some of there team are ex 501st members, which brings me to when I read the Anovos Adventures in Thermoforming page yesterday I could have sworn it mentioned the team had been cosplayers and members of the 501st, when I went back today it looks like that has been removed Since they aimed their Alpha and Beta kits at 501st members you'd think they would think about 501st approvability with the new kits but seems not. Also appears the forearms are going to need some work and paint too. Is anyone looking for a refund of their FOTK armor full kit + helmet pre-order or willing to give up their spot for $$? Do drop me a PM as I have dropped Anovos a msg and they are willing to assist in this transfer of ownership officially. Took me 2 months before they agreed to let me do so. Hahahaha well looks like it lol. I missed the initial offering on these, then decided I wanted one and ordered from a place that fell apart THE DAY I ordered but was lucky enough to get my money back, then I got the email from ANOVOS as I put myself on the interest list forever ago when people were dropping out. I'm really hoping I get one of these and my TLJ helmet. Im trying not to get too excited in case I end up on the next run which is a year out. If anyone is having problems with their refund, I would like to take over your slot. Im already in the queue, but would like another set. No problem with the wait for me. We get Anovos to transfer the name, and I’ll pay you directly. Win win for all parties. So let me know via DM if interested. Thanks. Anyone "in the know" hear anything? We are (only a couple days) beyond the latest shipping window, but this armor wasn't the only thing in that window. It's not looking good my peeps. I just inquired about my Kylo costume that was on a ship as of last week along with the FOTK kits and would would probably ship before the FOTK kits as of last week to be told today that they are pushed back to Summer 2019 with no explanation as to why other than that was what customer service was told. 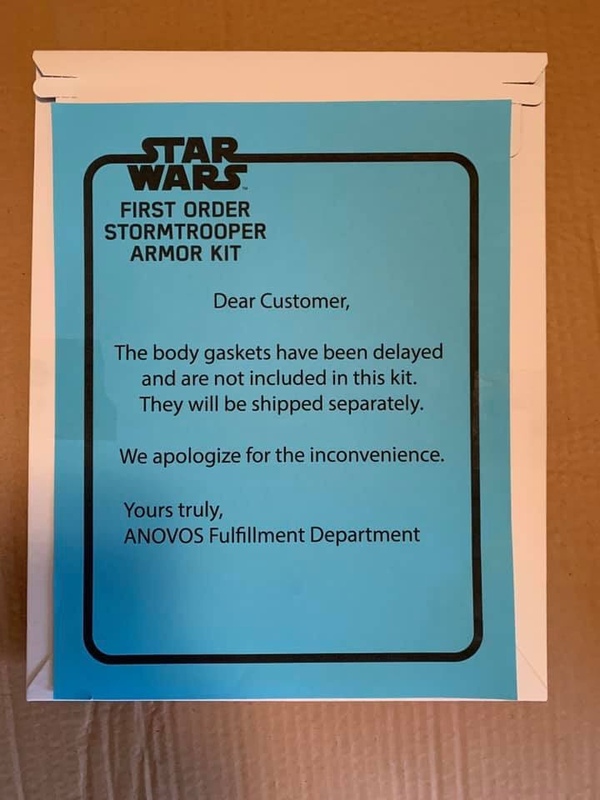 Unfortunately something is going on at Anovos and it isn't good and customer service is either not being told or can't say anything. I have been waiting for months on In-stock items too that haven't shipped. Well, the 19th came and went without even a whisper from Anovos. What a sh!t!y company. I contacted support about the First Order Kits and received this response. Ryan: Thank you for reaching out and waiting! As per the last update, the FOTK kits will be finally shipping in waves starting in march and continue throughout the rest of the year. We here in customer service do not have access to nor are given any customer order lists though our fulfillment team will send them out in the order we got the orders in. Furthermore the teams will update you via email when they are headed to our warehouse and when they are shipping. I asked about the date March 19th. Ryan: The website was never updated since our last update a month ago sorry to say. They still haven't updated the status on the page from the Sept 20th update either. I did notice today that their online customer support didn't seem to be up the hours they said. I ordered an in stock item almost two weeks ago and was going to ask about it. Last time I ordered an in stock flighsuit it was only 3-4 days to ship. I love the quality of their stuff, but their business practices are driving me away. I will be happy to get this FOTK and then stop paying attention to them ever again. I talked to them on the Kylo and they said it’s pushed back at least another season at minimum and didn’t know why but two weeks ago they said they were on the boat and would go out before the FOTK kits. So all we really know is customer service doesn’t know jack squat. After waiting this long I do feel it is a canned response but what does screaming in all caps on online chat help me? I do know some things I have ordered have been quickly delivered. I have seen things I did want to purchase from them but until this is cleared up I can't. I can't order another thing knowing they have thousands of dollars of goods I have yet to receive and I think its a shame as they may have made more sales from me. but going on 3 years leaves a very bad taste in my mouth, Yes I ordered multiple sets. Just some plain honesty and clarity would help their case but I have failed to see it. Afraid to block the "hey we got a new Boba Fett Blaster" in case I miss the your order is ready to ship email. And I can't believe customer service doesn't get updates from the back office as I work for a large company and every customer whether 50 Million in Sales or 15 thousand gets treated with the same respect and gets their concerns answered. These are not question's we are asking them they are concerns. Show the armor, show the armor!